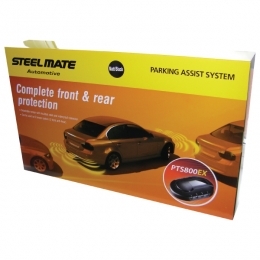 This system will cover the front and rear of your car (audible alerts). The front detectors are also switchable so you can turn them on and off as you see fit, Alternatively it is possible to purchase a CAN BUS adapter that will automatically switch the sensors on when you are traveling below 5 mph for an additional £49 (if your car is compatible). The rear detectors will switch on automatically when you put your vehicle into reverse. The system can be programmed to ignore protrusions such as nudge bars, tow bars or spare tyres and comes with anti false alert technology. The sensors come in black or silver but they can be colour matched at an additional cost, please supply your vehicle paint code at time of order. Steelmate PTS800EX Fully fitted front and rear parking sensors, audio only.